HH-66 is a superior quality, waterproof, solvent-synthetic resin adhesive. It is used extensively for bonding vinyl coated and vinyl laminated fabrics like Shelter-Rite and Weblon to themselves or to various materials. 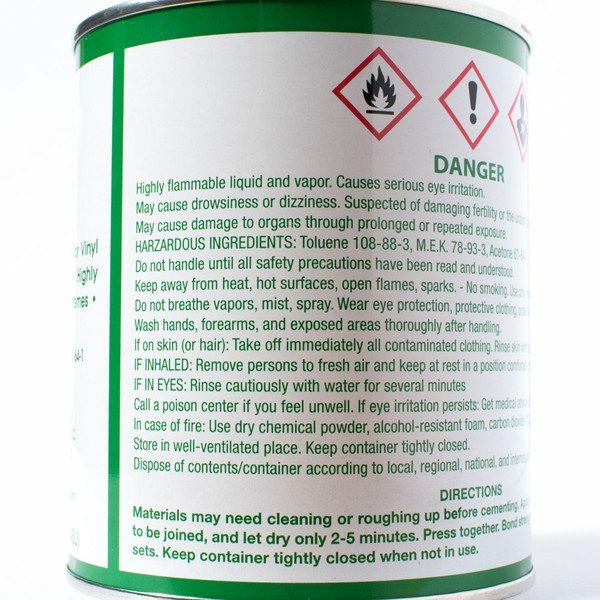 Also used to bond urethanes, vinyl foams and films, leather, and metals. 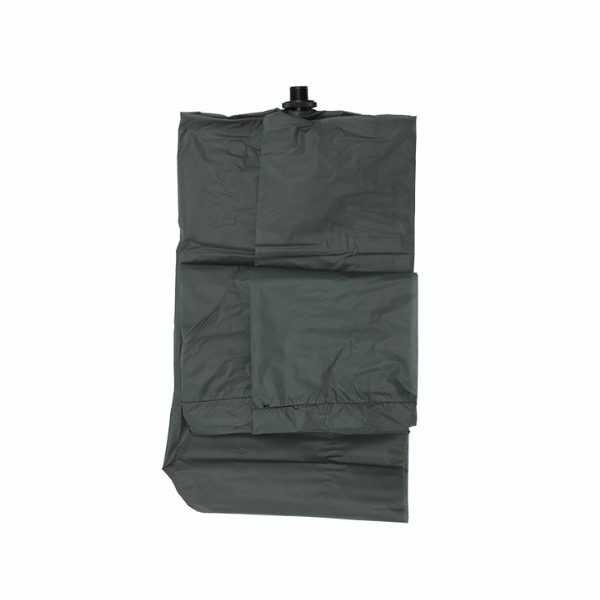 Outstanding for sealing or waterproofing stitched seams. It is also a perfect glue for repairing packrafts and attaching tie-downs and other accessories to a packraft. 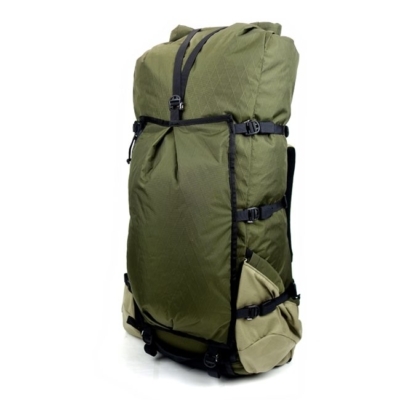 HH-66 dries hard and very strong, yet remains flexible. 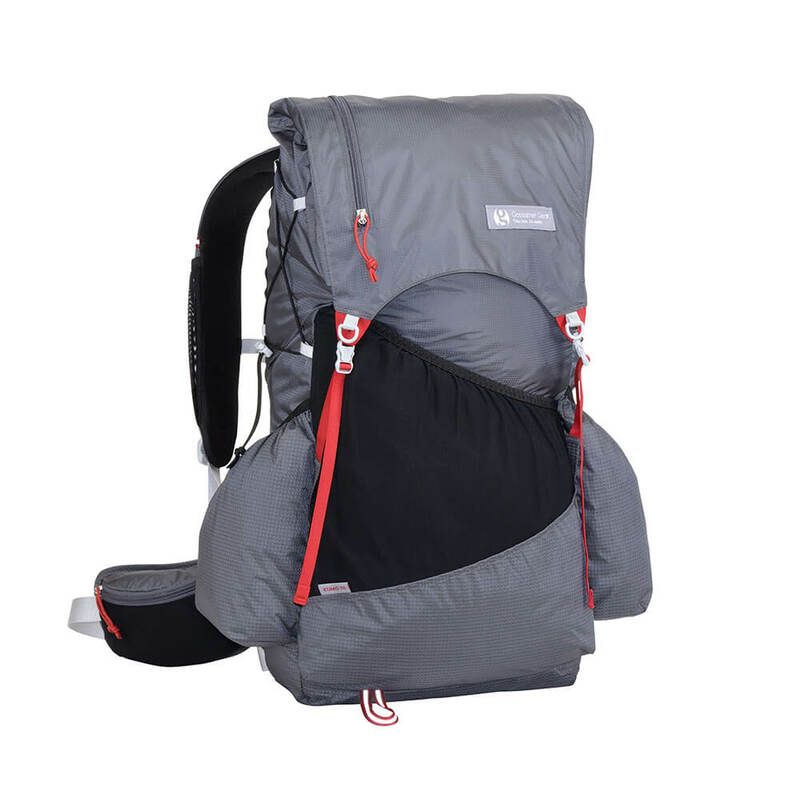 It is highly resistant to oil, fuel, grease and many chemicals. HH-66 is also not affected by weather and extreme temperatures. 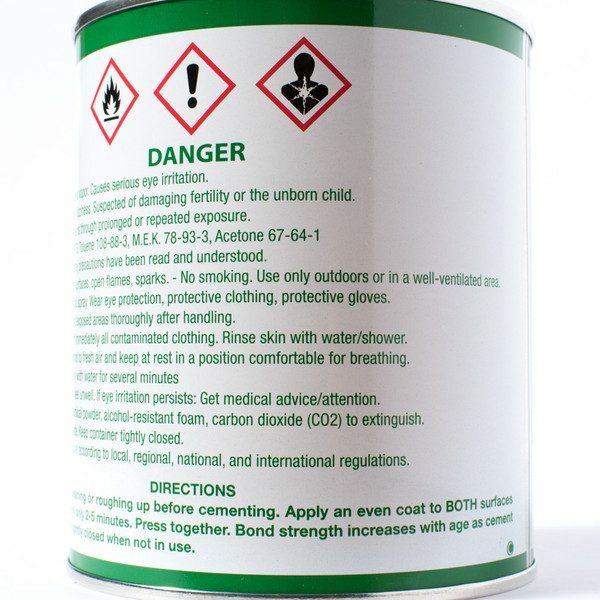 It can be applied at almost any temperature and is used in some of the world’s coldest climates, although the colder the temperature, the longer it will take to cure. Application is by brush, roller, or squeeze bottle. Dried films may be reactivated to a tacky state by high heat or solvent. HH-66 can be stored one year or longer, under normal conditions. HH-66 will freeze if stored in subfreezing temperatures for a period of time (the solvents will become slushy) but it can be righted by bringing it back to room temperature and a maple syrup-like consistency. Freezing will not affect the effectiveness of the product. 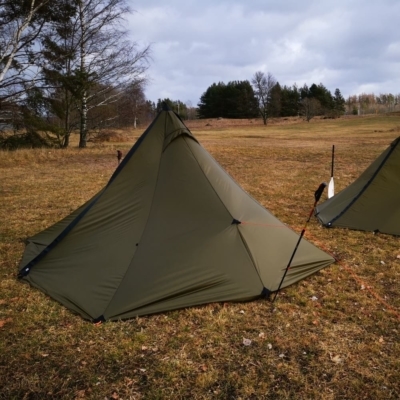 HH-66 is used widely in the manufacture and repair of vinyl tarpaulins, truck and pool covers, tents, awnings, liners, domes, inflatables, flexible signs, mats, tension structures, furniture, and sporting goods. Other vinyl applications have been with protective clothing, roofing and flashing, automotive materials, oil booms, footwear, flexible hose, industrial curtains, dock seals, and vinyl repair kits. 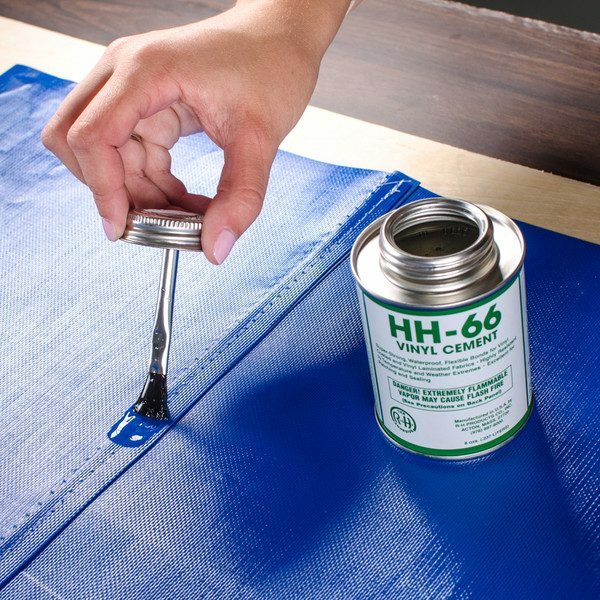 HH-66 will not work on polyethylene sheeting or tarps (like ready-made blue tarps). 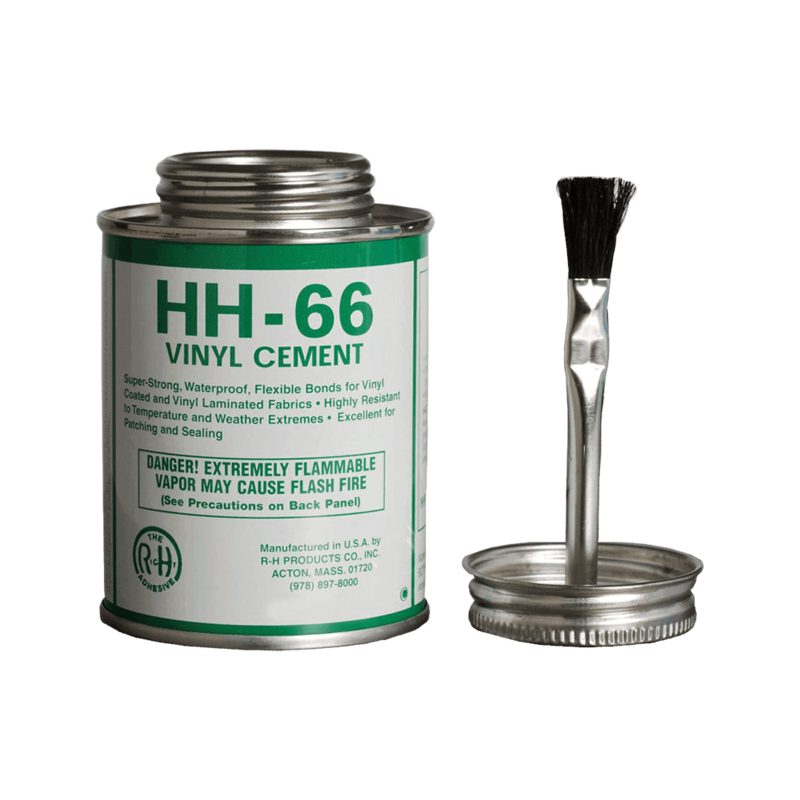 For Optimum Results: HH-66 should be applied by brush, although a roller may be used. Apply one coat to each surface. Application should be made bonding coated surface to coated surface using roller pressure to mate the surfaces. Although the material may be bonded while wet, optimum results are achieved when waiting 2 to 5 minutes before bonding the surfaces together. To repair a packraft, please follow the directions in this PDF. Please Note: The manufacturer does not recommend using HH-66 for longterm repairs on Hypalon surfaces. 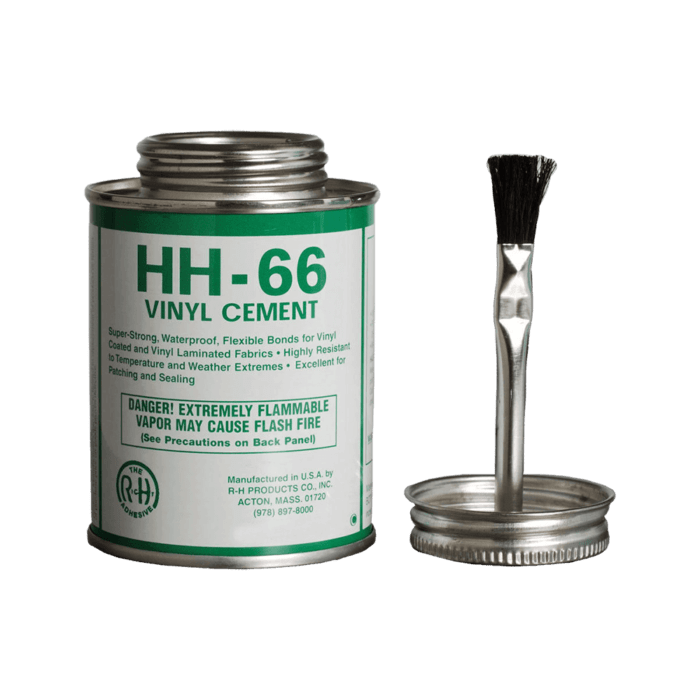 However, with proper preparation (including use of a mild abrasive and then cleaning the area thoroughly) HH-66 will work for adhering patches to Hypalon.